Before we decided to move to Lisbon, Antonio and I came here year after year. This was not a decision we came to lightly, and we spent a lot of time in Lisbon before finally deciding to become expats in Portugal. Throughout that time we could only stay 3 months at a time because of the way the Schengen visa is set up. This meant we could not rent an apartment in Lisbon, so we ended up staying at tons of AirBnBs. 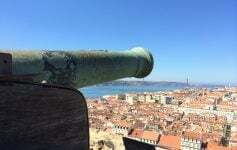 最近, tons of friends and people are asking me for recommendations on where to stay in Lisbon when they come to visit, so I decided to put it in a post so I can stop writing the same info for everyone. This is a list of my favorite AirBnB rentals in Lisbon. I did not include the crappy rentals, only the ones that I enjoyed. I will be writing a more thorough review of each one later, but for now, this will give you a brief idea of why I liked each of these AirBnBs in Lisbon. We loved this AirBnB rental in Lisbon’s Estrela neighborhood because it felt like a hidden treasure in the city. From the outside, it looked like any other apartment, but the flat was located in the center courtyard of a city block. The apartment was quite big. 它有 2 卧室, a great kitchen, a full living room with a super comfy couch, and a great dining room. The apartment also had three balconies and one was large enough for us to sit and enjoy a meal or glass of wine at the end of the day. This would be a lovely place for a honeymoon stay. This was by far, the largest AirBnB in Lisbon that we stayed at. It had a gorgeous view of the river Tejo and was in the heart of the Alfama. This was not AirBnB Ikea special. The furniture was absolutely gorgeous. The place had a soul. We stayed there during a particularly hot summer and the place was not air-conditioned, so consider asking the host if he has picked one up recently. 但, if you’re going in the Spring or Fall, you will have an amazing time here. This is a great option if you have children (because of the size), or if you are working during your trip and need space for a little quiet time. This seems like it was a wonderful experience. I will have to add Portugal to my travel bucket list. 也, I have yet to stay in an Airbnb and the more positive stories I here, the more I want to consider renting one. 谢谢. 这真的是. I came once and I was hooked. Wishing you an amazing Lisbon Visit.